Shops on the street Passarela do Álcool, photo by Kalyz. RIO DE JANEIRO – Porto Seguro is one of Brazil’s oldest tourist destinations, with many small hotels and charming beaches, stretching to ninety kilometers of coastline with coral reefs, bays and Atlantic forests. It has a very lively nightlife and shops stay open throughout the night. There is a wide variety of restaurants, from French to Italian and Japanese, and lanchonettes (snack bars) offering Brazilian food for sale by the kilogram. The weather is dry and warm, with a rainy season from May to August. It attracts tourists from all over the world and has an international airport. 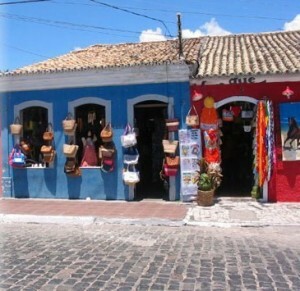 In the center of Porto Seguro, Cidade Alta is a national heritage monument and one of the first towns built in Brazil. At night there is a special illumination in place to enhance the view of the buildings. Among the many attractions are the Monte Pascoal, a national park of nearly 15,000 hectares; the Recife de Fora Park which can only be visited by boat; the Indian Reservation ‘Jaquereira’, where existing members of the Pataxo tribe live in a traditional Amerindian way; and the Pirata Island Aquarium Complex which combines eco-tourism with nightlife. Some of the popular beaches are ‘Muta’ beach, offering calm and transparent warm waters for bathing and water sports; ‘Mumdai’ beach, great for diving; ‘Lagoa Azul’ beach with clear sea and breaking waves; and ‘Coqueros’ beach with its golden sand and green seas, attracting bathers, divers and fishermen. A typical Porto Seguro lagoon beach, photo by Embratur. This area is generally considered to be the low to middle end of the housing market. For example, a two-bedroom apartment can be bought for just over R$136,000 in a condominium with two garage spaces and a shared swimming pool and BBQ. The condominium is 800 meters from the beach. If you are looking for a detached house within a condominium, three-bedroom country houses at the Xurupita resort are available for R$308,000, although villas in the same condominium are more expensive. They have ocean views and large verandas and share leisure facilities such as the pool and other sports facilities. Outside the condominium, 100 meters to the beach at Santa Cruz de Cabralia, a five-bedroom, five-bathroom house on a large plot of 1,695 square meters with a swimming pool is available for R$390,000. For a slightly larger budget, at R$430,000 a large, ocean-front three-bedroom house is available, with 329 square meters of construction and on a plot of 1,000 square meters with its own swimming pool, sauna, separate maid’s house and BBQ area. A newly constructed house, one kilometer from the beach, with four bedrooms and four bathrooms, swimming pool with a wooden deck and an American-style kitchen is available for R$510,000. If space is what you’re after, R$601,000 will buy 6,300 square meters in front of the beach, with a modern four-bedroom house, swimming pool and a lush tropical garden with many fruit trees. Investment opportunities can be found within hotel properties as well. For R$650,000 a fourteen-apartment hotel is available on a plot of 5,000 square meters, 200 meters to the beach. 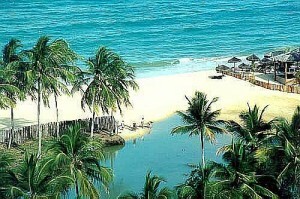 For R$1.7 Million, a hotel with 26 suites is available in central Porto Seguro. Land zoned for commercial development is available as well. For more information on the above properties see www.alexanderrichards.co.uk.